﻿LAST FEW UNITS LEFT TILL JUNE/JULY 2019!!! The unprecedented hit at Superbooth 2017 was this big-box bass beauty. Praised (and owned!) by the likes of Barry Burns (Mogwai, Arab Strap, SUMS), Alexander Hacke (Einstürzende Neubauten, Hacke / De Piccioto), Caesar Edmunds and Konstantin Gervis, this pedal captured the imaginations of no small number of people at a trade show dedicated to making insane sounds and sold out the first run immediately. Fed up of drive pedals that neuter the low end? 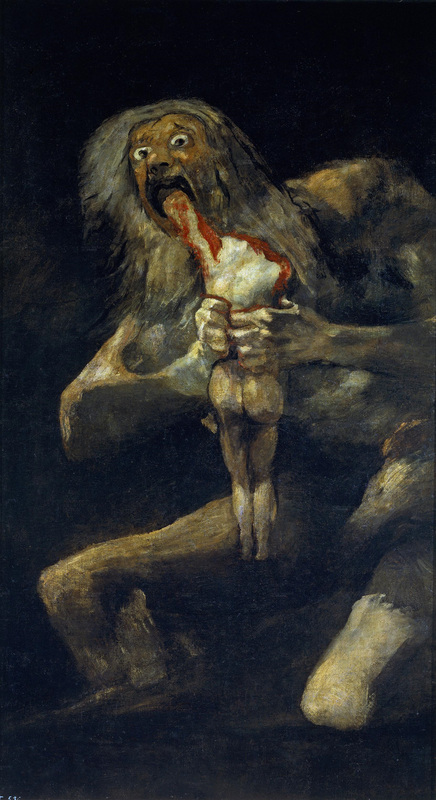 That's exactly how we felt when we set out to create a fuzz that would do Francisco de Goya's famous black painting, "Saturn Devouring his Son" , appropriate justice. With low-end saturation that has caused baffled onlookers to look for hidden subwoofers with no success, a wide range of clipping textures, drive that can go from a mild grunt to all-out wall-of-fuzz and a very musical tone control, the Godeater might be the last fuzztortion you look for. If your interests go beyond 4/5/6 strings, fear not. Godeater's intact low-end is a boon for downtuned guitar, doom/sludge/desert rock, or for bass-heavy synths and - you guessed it - drum machines. Two three-way switches to select between diode and LED clipping - or no clipping at all. One two-way switch labelled "Disgorge" allows you to use the Volume control as a clean blend.